Renowned as one of the top wilderness reserves in the world, Chobe National Park is home to the largest concentration of elephant on the African continent. The vast elephant population has had a significant impact on the park, thinning out the dense riverine thickets on the banks of the Chobe River. Chobe also boasts antelopes rarely encountered elsewhere in Botswana - the puku, the Chobe bushbuck, and the Sable antelope. The puku, with their shaggy orange-brown coats and V-shaped horns, can be spotted grazing the floodplains. In contrast, the Chobe bushbuck is nocturnal and rarely forms groups of more than one pair. ​Inland from the Chobe River, to the south, still part of the national park, is the Savuti area, which is home to four prides of lions. Savuti has it's own page here. With an incredible wealth of species, Chobe is a haven for birding enthusiasts. Striking colonies of carmine bee-eaters build their nests in the exposed sandy banks of the river. Water birds, including many species of duck and the rare red-billed pratincole can be spotted in their thousands, and guinea fowl and francolin dart through the grasses on the river’s edge. A quintessential African sound, the haunting call of the fish eagle can often be heard echoing over the Chobe River. ​As well as twice daily game drives, activities include boat cruises along the Chobe River, an excellent way of meeting more crocs, hippos and elephants. The busy northern sector of Chobe is, however, the best place in Botswana, arguably in all of Africa, for a short budget safari if you are prepared to share some of the sightings. 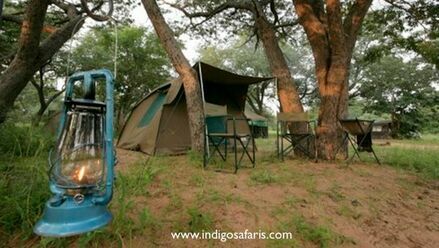 We have two-night, three-day camping trips into Chobe for $403 per person low season, $430 high season. Whilst Chobe NP can be quite busy along the riverfront in the northern sector of the park (though nothing like the Kruger NP or the Maasai Mara in migration season), there are other much more secluded areas around such Linyanti, further downstream towards the Okavango Delta, where the wildlife is just as intense, but where the higher prices keep visitor numbers right down, and Pandamatenga to the east. 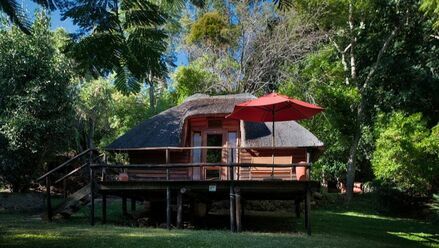 To the east of Chobe, close to Pandamatenga on the Zimbabwe border lies our favourite lodge in the area. Wildtrack Safari Eco Lodge sits on the now-fenceless border, surrounded by Hwange National Park, Kazuma Pans NP, Kazuma Forest Reserve and Chobe NP, all of which are unfenced. In the dry season the wildlife from these areas flock to the few permanent water holes close to the lodge, and large herds of the rare sable and roan antelope are commonly seen here. The only thing you don't see there are numerous other vehicles. There are no self-drivers, no day trippers, and only one other lodge 30 kilometres away. The wildlife is yours, as are the sublime sunsets. 2-night/ 3-day Chobe Camping Safari US$403 per person low season / US$430 per person high season (15 June to 15 September) Interactive itinerary here. 3-day Safari with Kubu Lodge Authentic Lodge Safari from US$910 per person sharing ​Interactive itinerary here. 4-day Safari with Kubu Lodge Authentic Lodge Safari from $1010 per person sharing. ​Interactive itinerary here. See longer itineraries including Chobe here.